There is no food more perfect than breakfast food. Pancakes, eggs, and bacon—if you want the basics, these Rhode Island breakfast places have you covered, and some even are masters of a more creative culinary implementation. Whether you’re looking for a more fun take on breakfast or a classic diner experience, come with a full belly to one of these Rhode Island breakfast nooks! As soon as you pull up to the red-painted, barn-style home that houses The Tree House Tavern & Bistro, you’ll immediately anticipate the kind of quirky atmosphere that greets you on the inside. Tucked off the highway, this restaurant boasts a dining space that will feel like your eccentric aunt’s home. The menu gives off that same kind of homey feel, with fantastic service to make you feel right at place. Julian’s has some of the city’s tastiest food in Rhode Island. Julian’s is a fan of original takes on classic dishes: If you’re out for breakfast, order a mimosa from their list of creative options, or perhaps a Bloody Mary. Make sure to order from their extensive menu of hashes, too—featuring roasted pork cheek, chipotle, and tomato roasted garlic. Located in the heart of the up-and-coming Jewelry District, Olga’s Cup and Saucer brings you an eating experience that feels like you’re in a friend’s backyard. The dining area simulates an outdoor porch, with wide windows and sturdy mosaic tables. Olga’s offers simple but quality fare and makes their own bread—make sure to try an omelet, French toast served on hearty brioche or a breakfast sandwich (especially the Lumberjack) and grab a cup of coffee to capitalize on those free refills all morning! Chef Derek Wagner crafts a culinary experience like no other at Nick’s—and judging from the lines at the restaurant every Sunday, Providence has caught on! Though the menu changes with the season, Nick’s vanilla-battered French toast can’t be beat. Want something even more savory? Try the Polenta of Geer Farm cornmeal with butternut squash and cheddar. Taylor Swift—who owns a home near Westerly—has been known to stop by The Cooked Goose on a summer morning. Perfect food for a day out on the beach, grab a Reuben sandwich with sweet potato fries or some incredible cinnamon roll pancakes. Dining in? You’ll love the great service and the cute interior. Looking to get off Newport’s beaten tourist path? Enjoy the atmosphere at the Corner Café—located right on Broadway—as well as delicious selections such as the Bistro Scrambler and home fries. Have allergies? Corner Café works hard to accommodate you and provides a large menu of gluten-free options. Dante’s is devoted to breakfast. 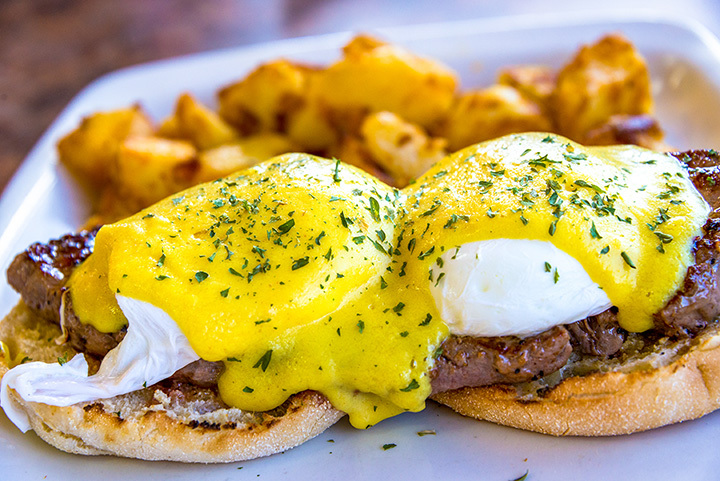 Even midweek, though, stop by to try the flavorful eggs benedict (make sure to add pastrami!) or the house made biscuits. Want a plate that’s both savory and sweet? Try the pulled pork hash with a pancake on the side. Simple, inexpensive, and fresh—Gel’s Kitchen is all that the perfect breakfast should be. This no-frills breakfast spot isn’t concerned with fancy concoctions, but they have perfected their staples. Locals love the corned beef hash and vegetable omelet. Those with gluten allergies will appreciate their gluten-free banana bread, packed with flavor and moisture. If you didn’t know it was a restaurant, Wild Harvest might appear to be a log cabin at first glance. But peek inside its doors and you’ll find a cozy spot with great outdoor seating—try some of their homemade chips or olive bread toast. With so many house made selections, you can be sure that everything is fresh and delicious! The Classic Café rightfully earns its name—you won’t find another traditional diner like this in Rhode Island. Slide into a table or barstool at its West Side location and order a selection of diner staples like a veggie breakfast sandwich or French toast. Be warned: The pancakes are huge! Looking for a more unique special? Try the Hashita, their house made corn beef that carries a Mexican flair.